1. Cook kale in a large pot of boiling salted water for about 10 minutes or until tender. Do not discard the water. Remove, rinse in cold water, drain, squeeze to remove excess water, and reserve. 3. In a large saut� pan over high heat, saut� mushrooms in 2 Tablespoons of olive oil until browned and cooked through (about 8 minutes). Remove from pan and reserve. 4. Return the saut� pan to the stove over moderate heat and saut� onions and chile flake until the onions are softened. Add garlic and cook for one more minute. 5. Increase heat to high and add the spinach to the saut� pan. It may be necessary to add it little by little as the spinach cooks. When all the spinach is well softened, remove from the saut� pan and let cool. 6. In a large bowl, combine cooled spinach, kale, portabellos, ricotta, parmesan, and salt. 7. Pour half of the tomato sauce on the bottom of a 9 x 13 baking dish. Stuff the shells with the ricotta mixture so that they are well filled. Place in stuffed shell snuggly on top of the tomato sauce in the 9 x 13 baking dish, with the seam sideways. 8. 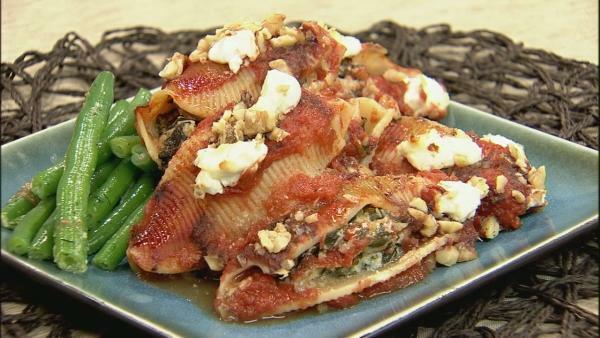 When all the mixture is used up, the 9 x 13 baking dish should be very full of stuffed shells. Pour the remaining tomato sauce on top. Cover with aluminum foil and bake in a 350 F oven for 45 minutes or until very hot. 9. Remove the aluminum foil and sprinkle the top with chopped walnuts. Also dot the top of the dish with small pieces of goat cheese. Continue to cook, uncovered for another 20 minutes. Serve.